This course is aimed at providing adequate training for individuals, who will be responsible for the weekly inspections or operation of adjustable pallet racking, to understand the importance and methods of identifying, reporting and inspecting damage together with the required actions. Employees will gain the necessary skills and knowledge based on the latest European standards to enable them to evaluate damage identified during racking inspections. 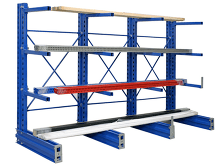 They will take part in a pallet racking safety tour aimed at highlighting hazards within the structure and gain useful safety tips on the effective management of the racking system. Understanding the responsibilities of everyone involved in the safe operation of the storage system. Understanding of the importance of Damage identification and the required actions. Identification and classification of SEMA racking damage levels. Understanding reporting systems and documentation.